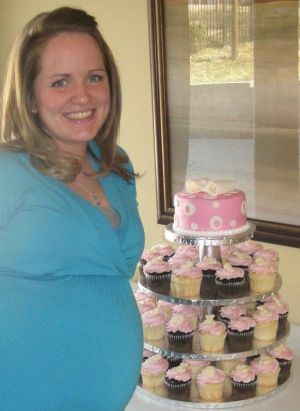 The cupcake flavors were chocolate and vanilla with a pastel pink butter cream icing topped with candy melt baby items. 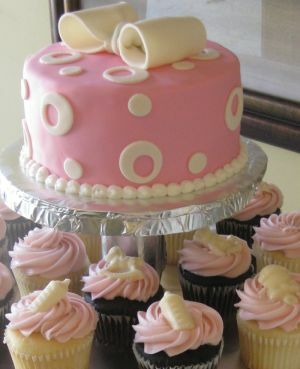 The cake was French vanilla with butter cream icing covered and decorated with our hand made marshmallow fondant and topped with an edible white bow. Email Steph about baby shower cupcakes here! 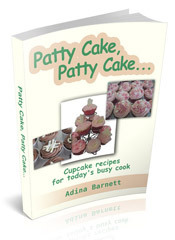 See how easy it is to make and decorate beautiful cupcakes yourself! 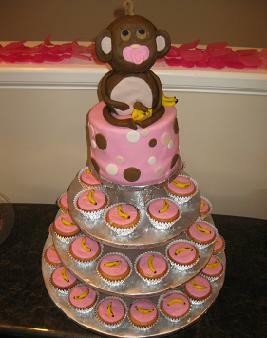 Kristie S. from Raleigh ordered this monkey baby shower cake for her daughter Kali’s baby shower. 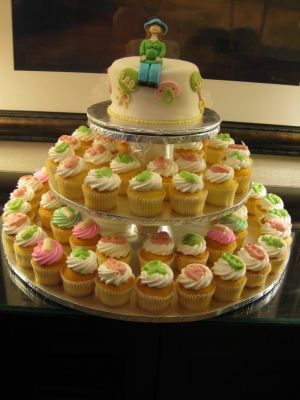 The cupcakes were banana cream filled with fondant decorated banana toppers, yummy! 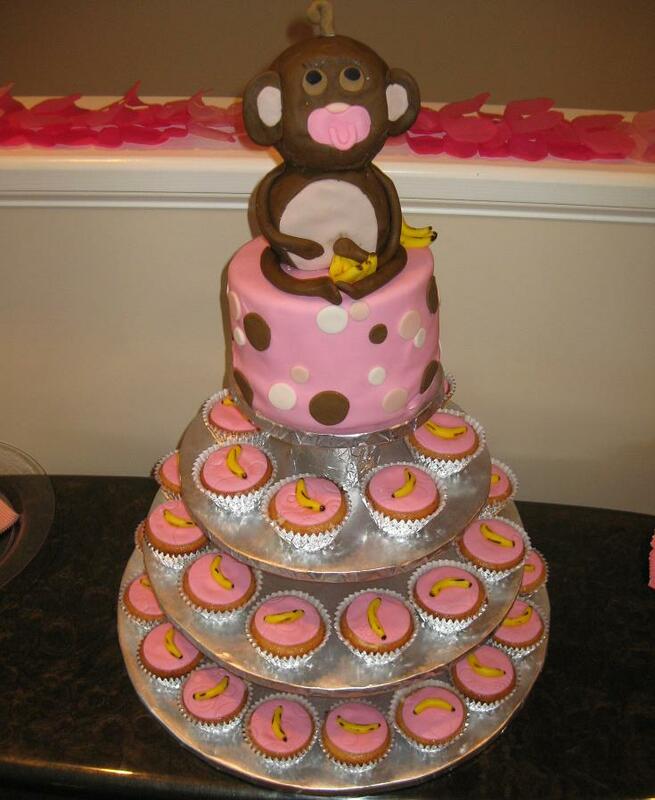 The baby shower monkey was covered in chocolate fondant. 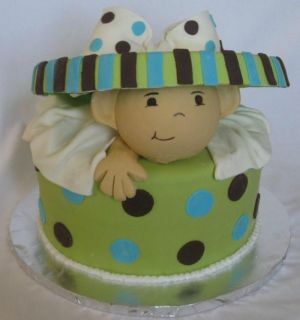 Design you top cake to match your theme and colors like this baby box cake. This peek a boo design is available in a six inch or eight inch top cake. Send us your invitation, your colors, and theme for some design ideas. 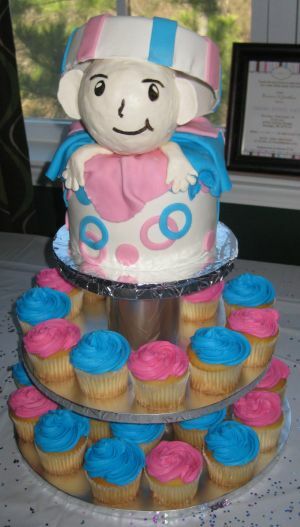 These baby shower cake cupcakes were topped with candy melts and colored to match the theme. 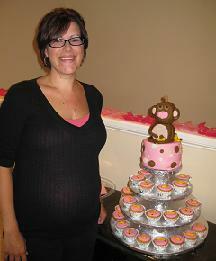 The pregnant lady topper was made using our hand made marshmallow fondant, yummy! Take a look at gender reveal cupcakes! Use neutral colors for decoration and icing and everyone gets one. When they take a bite...everyone finds out the baby gender with the inside blue or pink! See more pictures and ideas for baby gender cakes here!